Russian Ambassador to the United Nations Vassily Nebenzia has called on the United States and its allies to drop plans for potential military intervention in Syria, warning he “cannot exclude” the possibility of direct military confrontation between Moscow and Washington in case the Arab country is attacked. 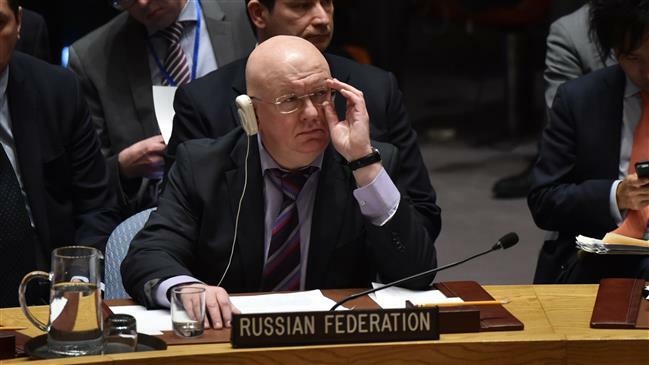 Speaking after a closed-door UN Security Council meeting over US President Donald Trump’s threats of an imminent military action against Syria over an alleged chemical attack, Nebenzia told reporters Thursday that the presence of Russian troops in the Middle Eastern country had made the situation even more dangerous. So far none of the Security Council meetings over the issue has yielded result. Calling another meeting of the council for Friday, Moscow has asked UN Secretary General Antonio Guterres to brief the body in person. Sweden also launched a new bid to prevent escalation by proposing a UNSC resolution on Thursday that would ask Guterres to send a high-level disarmament team to Syria to address “all outstanding issues” regarding the use of deadly chemical agents as weapons. Some UN diplomats told Reuters that the proposal had failed to win much support among the 15-member council. Moscow and Damascus have already invited the Organization for the Prohibition of Chemical Weapons (OPCW) to send a fact-finding mission to Douma and investigate the alleged use of chemical weapons there.